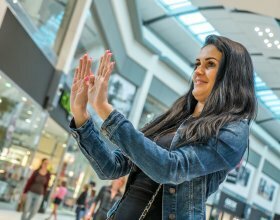 The pilot project GIMMO Virtual Promoter was implemented in the toy store POMPO in the Metropole Zličín shopping mall between May 24 and June 27. The customers had the first and unique opportunity to see the LEGO Ninjago Application and play an entertaining interactive game. During that period that also included the Kids´ Day on June 1st GIMMO attracted more than 20.000 passers-by, i.e. it stopped 14 % of all persons that walked by. Full 25 % of those who stopped joined the LEGO Ninjago Application actively. The active users spent at GIMMO Virtual Promoter 81 sec on average, which is significantly much longer time of influencing a potential customer compared to other media. GIMMO Virtual Promoter proved to be a very interesting advertising device and a source of information; a device that can attract customers´s attention for a very long time in comparison with other digital signage media. The project was also supported by a promotion to purchase LEGO products with 10% discount in the Pompo store for those who obtain a discount voucher while playing the Application. No less than 4 % of those who communicated with GIMMO Virtual Promoter actively, joined the promotion activity that was part of the LEGO Application communication.